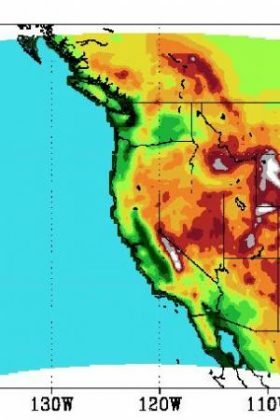 CORVALLIS, Ore. – Tens of thousands of “citizen scientists” have volunteered some use of their personal computer time to help researchers create one of the most detailed, high resolution simulations of weather ever done in the Western United States. “When you have 30,000 modern laptop computers at work, you can transcend even what a supercomputer can do,” said Philip Mote, professor and director of the Oregon Climate Change Research Institute at Oregon State University, and lead author on the study. The sheer number of simulations tends to improve accuracy and reduce the uncertainty associated with this type of computer analysis, experts say. The high resolution also makes it possible to better consider the multiple climate forces at work in the West – coastal breezes, fog, cold air in valleys, sunlight being reflected off snow – and vegetation that ranges from wet, coastal rain forests to ice-covered mountains and arid scrublands within a comparatively short distance. Although more accurate than previous simulations, improvements are still necessary, researchers say. Weather@Home tends to be too cool in a few mountain ranges and too warm in some arid plains, such as the Snake River plain and Columbia plateau, especially in summer. While other models have similar errors, Weather@Home offers the unique capability to improve simulations by improving the physics in the model. Ultimately, this approach will help improve future predictions of regional climate. The social awareness of these issues has “matured to the point that numerous public agencies, businesses and investors are asking detailed questions about the future impacts of climate change,” the researchers wrote in their report. This has led to a skyrocketing demand for detailed answers to specific questions – what’s the risk of a flood in a particular area, what will be future wind speeds as wind farms are developed, how should roads and bridges be built to handle extremely intense rainfall? There will be questions about heat stress on humans, the frequency of droughts, future sea levels and the height of local storm surges. New participants in this ongoing research are always welcome, officials said. If interested in participating, anyone can go online to “climateprediction.net” and click on “join.” They should then follow the instructions to download and install BOINC, a program that manages the tasks; create an account; and select a project. Participation inclimateprediction.net is available, as well as many others.